Zober Coat Rack A contemporary twist on the standard coat rack; this staple homeware piece is sure to make a chic statement. 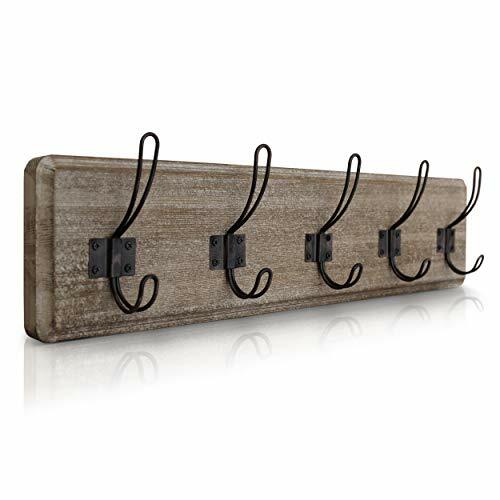 Place this coat rack in the hallway or foyer to give your family and guests a spot to hang jackets, scarves, coats and sweaters when they arrive. The rack is tall enough to accommodate coats of longer lengths. Dimensions: Coat rack; 69.5" tall, each leg 12" long, leg to leg 18", hooks 5 ½" in length. 6 Convenient Hooks Form meets function with the Zober coat rack. It’s tree like silhouette features 6 convenient bars for hanging garments and accessories. 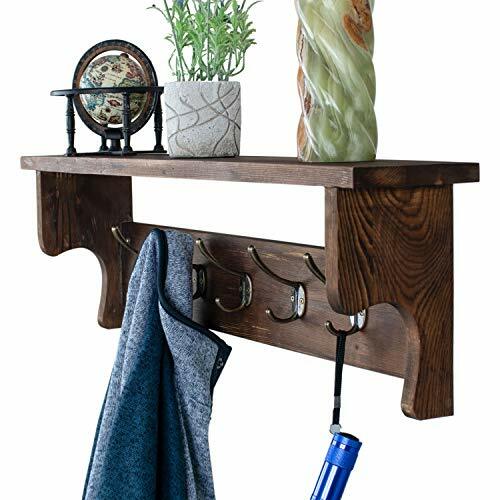 The top of the rack can be used to hang a hat, the top tier of bars are excellent for longer coats, while the lower tier is ideal for smaller jackets Neutral Hue Complements Any Surrounding This contemporary coat rack is made of solid wood for both style and durability. The natural finish looks great in any location. 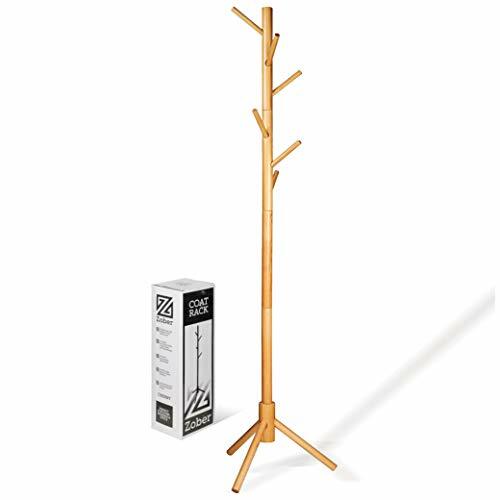 Lacquered Pinewood Construction Constructed entirely of high quality pinewood, users can be sure this coat rack will last for years to come. The coat rack has been lacquered for a smooth finish that won’t snag garments. 3 Prong Legs for Stability The sturdy coat rack is stabilized with 3 prong legs that ensure balance. Easy Assembly Assembly is required to set the coat rack up. Beautiful solid wood coat rack. 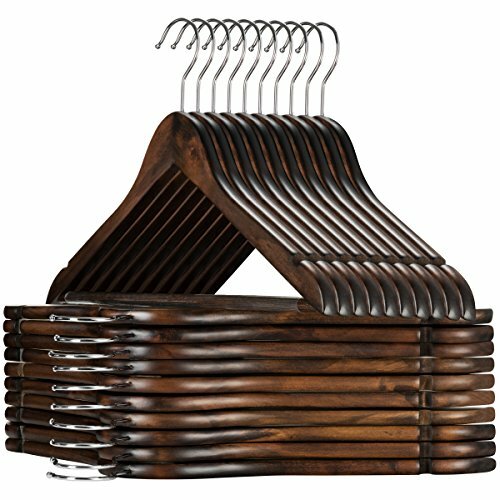 Topline Classic Wood Dress Hangers - Natural Finish (10-Pack) - Fulfilled by Amazon. Zero-risk, free returns. - Strong construction, holds firm and won't bend like cheaper woods and plastics. - Rotating 360-degree hook. - Smooth polished finish and chip-resistant. - Rich decorative woodgrain. - Detailed carved notches. - No assembly required. Ready to hang your clothes right out of the box. - Made from sustainable Hevea Wood. 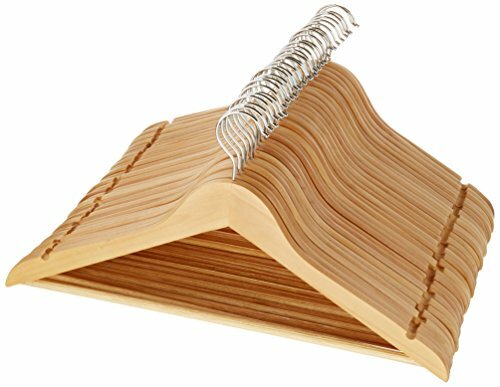 - Individual Hanger Dimensions - 12 x 4.6 x 1.2 inches. - Packaging Dimensions - 15.7 x 13.25 x 3.2 inches. About Hevea: - All-natural and eco-friendly, Hevea hardwood is one of the strongest and most durable woods in the industry. - Superior grain density ensures that the wood never loses its integrity or shape. - Non-toxic material means that it will keep your clothes clean and fresh. About Topline: - Our mission at Topline is to create a comfortable, healthy, clean, and serene home environment through rigorous product design and development.- We strive to complement a home's natural comforts with home-goods that elevate quality of life. 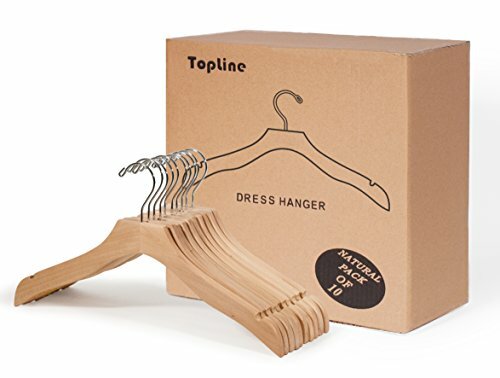 Topia Hanger Natural Wooden Coat Hanger,Suit hanger,Glossy Finish with Extra-Wide Shoulder,Thicker Chrome Hooks & Anti-slip Bar, 6-Pack Extended and Widened Design is suitable for heavy clothes; Great for hanging Suits, Jackets, Pants, Shirts, Skirts, Dresses, Blouses & Accessories Key Product Features: 1. Each Dimension(LxT): 17.5"*2.2" 2. Material: High Grade Schima Superba Wood 3. Color: Natural Color 4. The broad shoulder 2.2 "5. Special Designed Extra Thick Flat Hook (0.23") 6. Screwed Round Wooden Bar with Extra Thick Non-slip Rubber Tube for Hanging Pants7. Smooth Surface by High Glossy Finish( as new hanger,small lacquer smell will exist. It will disappear in few weeks.) Our model is unique, and our value proposition is deep. 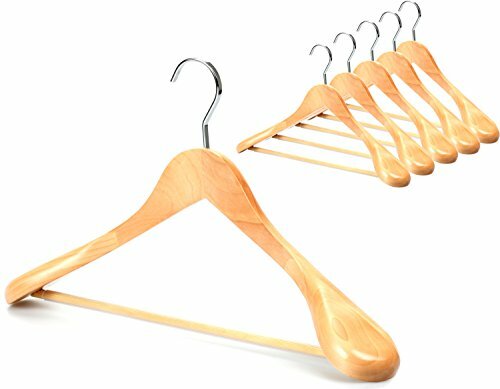 For this CT02 series, innovative designed new hook & High Shiny Lacquering, not only make hanger stronger but also upgrade clothes' good image and quality. 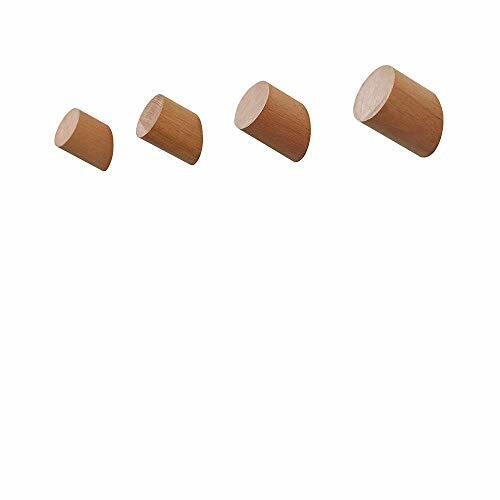 Besides, we dedicate to improve any specific function of hanger, like the broad shoulder( 2.2" ), Screwed Round Wooden Bar , Extra Thick Non-slip Rubber Tube etc. 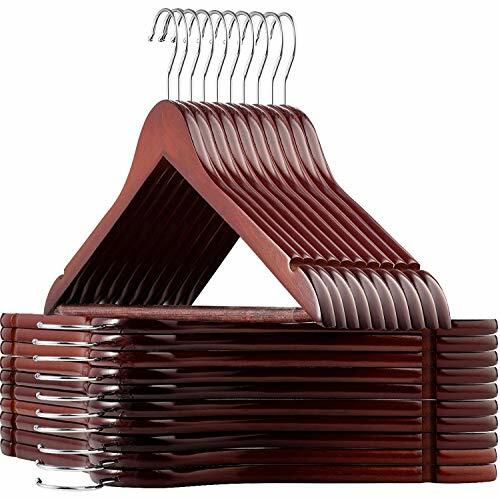 Topia hanger is only hand made hanger, no beautiful words but only high quality hanger. Topia hanger will definitely light up your clothes and life. Shopping Results for "Wooden Coat"